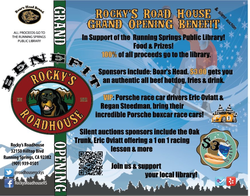 Rocky’s Roadhouse, 32150 Hilltop Blvd., Running Springs, will be hosting a grand opening and silent auction from noon to 4 p.m. Saturday (April 28). All proceeds will benefit to the Running Springs Branch Library. Deals at the deli’s event include a Boar’s Head beef hot dog, fries and a drink for only $3. Porsche Boxster race car drivers Eric Oviatt and Regan Steedman will make an appearance and will bring their race cars along! Silent auction items include an oak trunk and gift basket, and a one-on-one race lesson with Eric Oviatt. For updates and more information, visit Rocky’s Roadhouse’s Facebook page or follow them on Twitter. Baker’s Drive-Thru has another coupon for a free item posted on its Facebook page today (April 23). Today’s coupon is to introduce Gold Peak sweetened tea, which was recently rolled out at all Baker’s locations. Head to Baker’s Facebook page for the coupon, which you can either print out or simply display on your mobile device. One offer per coupon. One coupon per person or per car. Valid today only. Also, Baker’s has launched its 60th anniversary sweepstakes, through which Baker’s will give away 60 three-day, two-night stays in Las Vegas and 60 $100 Baker’s gift cards. Baker’s locations can be found throughout the Inland Empire. As if there weren’t enough food-related events happening this weekend, here’s one just for you chocoholics! It’s called Chocoholics Anonymous the Inland Empire Chocolate Festival, and it’s taking place from 11 a.m. to 6 p.m. tomorrow (April 21) at the Hilton Ontario Airport Hotel, 700 N. Haven Ave., in Ontario. In addition to chocolate tastings, the event will also include culinary demonstrations, music and entertainment. Advance tickets are $15 (plus a $1.50 service fee), which includes five chocolate tasting tickets and three wine tasting tickets, which can be exchanged for chocolate tasting tickets (for those under 21). Advance youth tickets (12- to 17-year-olds) are $10 (plus a $1 service fee) and include four chocolate tasting tickets. Tickets will be $20 at the door for adults and remain $10 for youth. For more information, and to see a list of participating vendors, click here. It’s not the golf aspect of this event that warrants its inclusion in this blog…it’s the food, beer and wine that does. The Golf, Wine and Dine Expo will take place from 10 a.m. to 7 p.m. tomorrow (April 21) at the Ontario Convention Center. In addition to being able to check out the latest in golf equipment, attendees can sample fine wines, succulent food, and brews from the Inland Empire’s best wineries, restaurants, and craft breweries. Wine and beer tastings will be available through the duration of the event, with free popcorn, restaurant tastings and free snacks available at different times throughout the day. Click here for a schedule. Tickets are $10, and proceeds benefit the PGA Southern California Foundation and the Make A Wish Foundation of Orange County and the Inland Empire. Follow the jump for a list of participating restaurants. Seasonal restaurant Wild Rocket is hosting fellow Redlanders HundeHous as they present their Sausage Fest until 7 p.m. tonight (April 19). Event menu items include bratwurst, bacon and duck sausage, chicken mole sausage and Belgian fries. A selection of German, Belgian and American beers is also available. For more information, visit Wild Rocket’s Facebook page. Wild Rocket is at 345 W. Pearl Ave., Redlands. Want to help a bakery get on Cupcake Wars? Today’s assignment, should you accept, is to help our friends at De “Bite” Ful Cake Pop Shop create their Cupcake Wars audition video. Here’s all you have to do: Visit their booth tonight (April 19) at Redlands Market Night. Their cake pops and cupcakes are delicious, and they’ll have lots of flavors to choose from. Their booth is normally on the north side of State Street, between Orange and Fifth streets. With your help, perhaps we’ll see them on season seven of Cupcake Wars…thanks in advance! One of the current Google Offers is $31.50 worth of organic produce (fruit, veggies or a mix of both) from Farm Fresh to You delivered to your home for only $15. It appears they deliver to the Inland Empire on Fridays, with the exception of high and low desert cities, which they do not deliver to. Sorry, Victorvillains! To verify delivery in your area, click here. You can redeem the offer any time between now and October 14. Also, you must subscribe to Farm Fresh to You’s delivery service to redeem, but you can cancel after the redemption. To see your options and purchase the deal, click here. Inland Empire-based Baker’s Drive-Thru, which is celebrating its 60th anniversary this year, has been posting coupons for 60¢ deals for its Facebook fans (and others). Today’s (April 18) coupon is for our favorite Baker’s menu item, the egg burrito. Since the egg burrito is only available during breakfast hours (’til 11 a.m.), Baker’s is expanding the deal over two days. You can use the coupon either today or tomorrow (April 19). The coupon is posted on Baker’s Facebook page. You can either print it or display it on your mobile device. The usual restrictions apply: One offer per coupon, one coupon per person or per car. Be sure to follow Baker’s on Facebook to catch all the 60th anniversary deals. Baker’s Drive-Thru locations can be found throughout the Inland Empire, including the newest location in Rancho Cucamonga, at 12009 Foothill Blvd. You have done your taxes already, haven’t you? Free Shanghai Angus Steak entre today with coupon, here. Panda Express locations can be found throughout the Inland Empire. Get 15% off dine-in and take-out food orders. Not valid on alcohol or Happy Hour menu. Details here. Find P.F. Chang’s in Rancho Cucamonga, Chino Hills, Riverside, Temecula and Rancho Mirage. Free value curly fries with coupon, here. You can also enter to win $5,000 in Arby’s Tax Relief Sweepstakes here. Arby’s locations can be found throughout the Inland Empire. Happy Hour pricing (half-price drinks and slushes) all day. Sonic has Inland Empire locations in Rancho Cucamonga, Victorville, Apple Valley, Yucca Valley, Cathedral City, Hemet and Murrieta. This weekend is a big one for food truck fans! Redlands’ first food truck festival is Saturday (April 21) and Sunday (April 22) is San Bernardino’s. 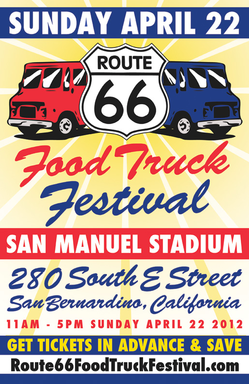 The Route 66 Food Truck Festival, the latest event curated by KVCR-TV’s Out to Eat host Cliff Young, will take place from 10 a.m. to 5 p.m. at San Manuel Stadium, 280 S. E St.
Cliff has 24 trucks lined up for the event, including the I.E.’s own Where’s the Fire? Gourmet Pizza and Suite 106 Cupcakery. Proceeds from the event will benefit Symphonie Jeunesse. General admission tickets (11 a.m. entrance) will be $15 at the door. V.I.P. admission tickets (10 a.m. entry instead of 11 a.m., plus seating in the V.I.P. area with free water and soda) are available now for only $20 (plus $1.49 service fee) by clicking here. Parking is $5. Cliff is offering a discount for Dine 909 readers. You can purchase general admission tickets for only $5 (plus a $1.12 service fee) by clicking here, clicking the “Enter promotional code” link and entering “SUN”. Click over the jump to see the lineup of scheduled trucks.